My fence boxes are complete. Yesterday I put out the transplants for our cold crop and began the transition to the winter garden. Naturally, after our cold, wet summer, the past week has been dry and quite hot. 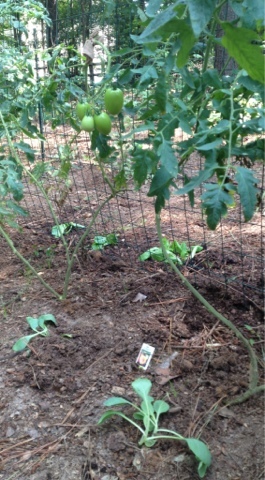 I had to run the sprinkler yesterday because the garden soil was dry deep down. 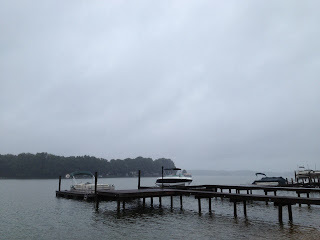 I've noticed over many years that a cold spring or summer often is followed by a hot winter. My hope this year is for a warmer winter, but with weather still cold enough to protect against insects and disease. If the weather isn't too cold I often get a greater yield from my winter plants for the very reason that they are not so harassed by pests and pestilence as in summer. Much to Jerry's chagrin, I discovered transplants were ready at the store and stocked up on cabbage, lettuce, cauliflower, more rhubarb, and some winter herbs. Jerry worries about me shopping at hardware and garden stores the way most men fear their wives frequenting shoe stores! I really should have tried to start these from seed, but we no longer have a sun room in our house, and that is where I always placed my seed flats. I have some old windows I took from my grandfather's barn, and I hope to someday make some cold frames from them for the express purpose of seed-starting and early transplanting. Yesterday, planting Bibb lettuce (a favorite of mine; I could eat it all day long!) and watching it practically disintegrate I promised myself to try and learn more about hydroponics. Lettuce, especially delicate Butter or Bibb lettuce, really doesn't transplant well. It's just too fragile. It also gets eaten practically the minute you put it out, and it gets sunburned; that's why I'd like to try growing it hydroponically. My usual protocol is to sow seeds for lettuce, Mesclun mix, spinach, and peas every couple weeks throughout the fall and spring. That way, I always have a new crop coming up and I can pick the lettuces when they are tender babies rather than waiting for heads to form. I find I have much less problems with pests like cabbage worms that way, and I prefer the taste. 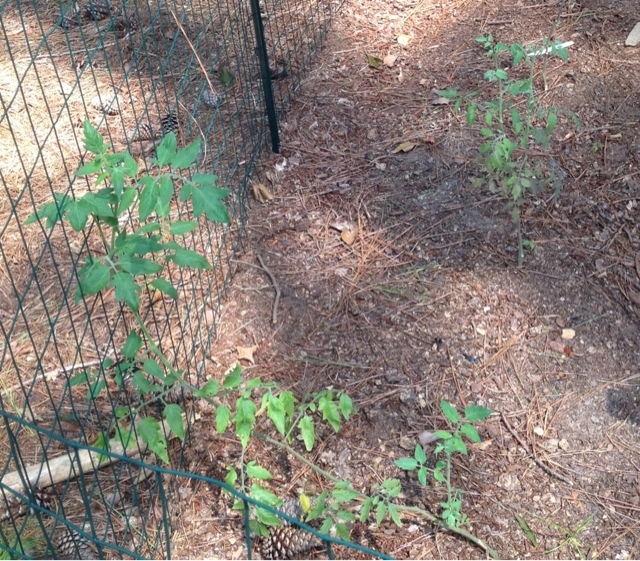 The tomato tied to the metal fence with nylon is far more robust than the other plant. I promised you a report on the success of the nylon ties, and I do believe they are working. We had been picking just one or two ripe tomatoes each week before and now we have had three already this week. The dry weather is also helping, I'm sure. I did set up a little experiment, however, and have documented the results. I have one row in the garden which hasn't done well all summer. I have a row of tomato plants there and they are all small and scraggly. I bent the tallest one over and tied it to the metal fence with a nylon. I left the others untied, as a "control group". 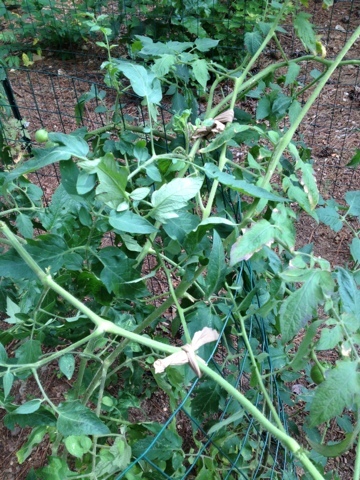 Well, my tied tomato has grown measurably over the past week and has little to no yellowing of the leaves, whereas my control group is still tiny and scraggly and have leaves starting to yellow. So it would seem the static electricity caused by the contact of the nylon tie with the metal fence does help create more robust plants. Cabbage and lettuce started under tomatoes to protect them from the sun. I'm trying a few more little tricks I've heard about over the years. First, since I'm planting winter crops in hot weather, I am staggering the plants, putting a cold plant like cabbage or lettuce, underneath the taller summer plants, like peppers or tomatoes. This shields the winter plant from the sun while it's still small and tender. When the summer plants die back the winter plants should have hardened off enough to face the sun and weather on their own. I'm trying peat pot tops as guards against cabbage worms and slugs. 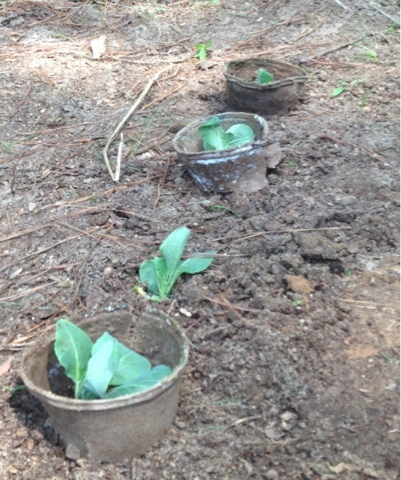 Then, I am trying to re-use the peat pot tops as cabbage worm guards. Peat pot manufacturers advise you to cut away part of the pot to let the plant's roots grow out without shocking them. I always cut away the shrink-wrapped part, since it's so hard to remove without tearing the pot. I arranged these as little guards around the plants' stems to keep slugs and cabbage worms and other crawling pests away. This won't work for flying insects, so I will still have to put in floating row covers. Besides peat pot tops, I've also used clear plastic cups for this. You cut out the bottom of the cup and place it around the plant to protect it. I still need to sow carrots from seed (they also don't like being transplanted) and I didn't see any kale already started so I'd like to get that in as well from seed. I also have harvesting the summer herbs on my list. I want to dry and freeze them and make a bunch of pesto. There's just always so much to accomplish, and never enough time! Because I spent the weekend working on my store and getting the kids ready for school I fell behind on my cleaning and the house is trashed. Or was trashed, because I cleaned the floors and washed laundry for hours yesterday. I still haven't finished the whole house, though, and my sister and her family are coming to stay this weekend, so I need to get on it. I woke up feeling unwell today, though. Nothing much is actually wrong except my allergies are bad and I am just exhausted. My limbs feel heavy and I could barely drag myself out of bed this morning. I suppose I'm just so out of shape from sleeping in all summer that getting up early combined with housework and garden work did me in. I also walked about four miles last night, the first I've walked for a while. I have to change my diet and exercise routine constantly, or my body gets used to it and starts gaining weight. My grandmother, who grew up in the Depression and so had a different point of view on these things, always called this our "good" genes. She said we'd always be sure to survive a famine! So, a few weeks ago I got a really terrible blister from my new running shoes and I switched to dancing in bare feet until it healed. I also had to switch up the smoothie diet. Even just having a kale smoothie for breakfast and lunch and then a regular dinner, I was not losing weight anymore! I have had a lot of people commenting on how good I look lately, and so I want to keep it up. So now I'm trying Dr. Oz's new Ayurvedic plan. You are supposed to get 50% of your calories at lunch and drink a slimming tea all day. Dr. Oz's weight loss "tea". The "tea" has no actual tea in it, so it's great if you're trying to give up coffee or tea or iced tea so you can be a Mormon! You mix 1/2 teaspoon each whole fennel, cumin, and coriander in 5 cups of boiling water and simmer 5 minutes. Then strain out the seeds and drink it all day. I don't have whole cumin or coriander, so I'm running ground spices through the coffee maker or using a tea infuser lined with a coffee filter. It's weird, but not bad. The tea smells like a taco, but it doesn't have much taste at all. I substituted it for part of my wine last night, since you're supposed to eat as little as possible after 3PM. I guess I'll do this for a while and then move back to my smoothie diet. Last summer I switched plans every week or so and I did lose some weight. We shall see. 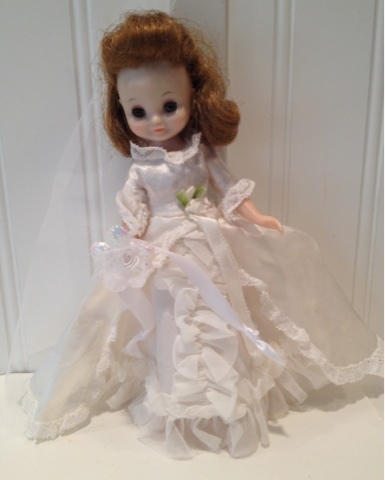 American Character's Tiny Betsy McCall in her wedding gown. 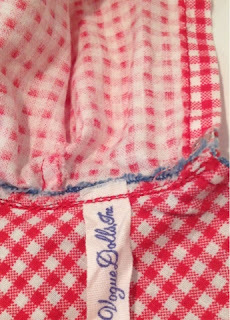 Besides all the gardening and housework, I've been restoring some old 1950s Betsy McCall clothes. I finished the Sun N Sand set and sold it and now I've finished the wedding gown. I still have Pajama Party and some odds and ends to complete, along with a doll. 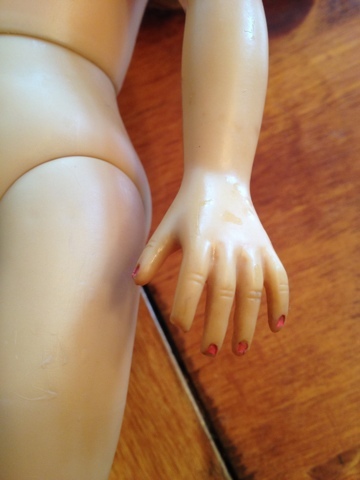 The doll's hip needs to be re-attached, so I'm trying to get that done so I can list her. 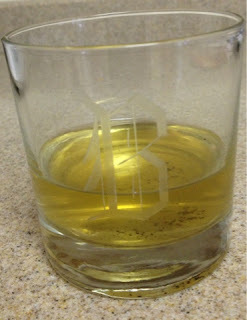 Today I got a Binnie Walker with a big crack in her face, too, so I am starting on her. I sent my Ginny Baby off to Norway already, and my little Twinkle Toes Betsy went to Oklahoma, so once again my cabinet is looking bare. Keep checking my store for Betsy and her clothes: http://stores.ebay.com/atelier-mandaline. I mentioned my new lot of dolls a post or two ago, and I've been working so hard on them I'm almost cross-eyed with exhaustion. I have finished quite a lot in the past week, and have a bunch of new stuff in my store. Of course, I found yet another ballerina in the new lot, and then another ballerina outfit as well! I'm getting to be quite the ballerina expert! 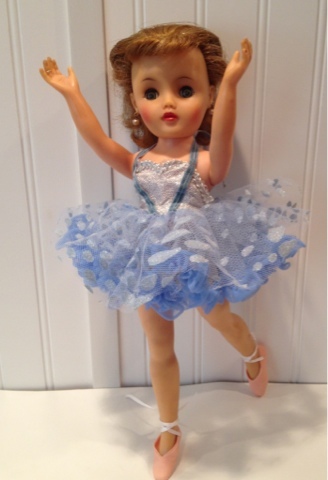 This newest ballerina doll is a mystery. She has different markings indicating various manufacturers. Her head has a Valentine mark, but her back has a mark used by Belle, I think, or maybe Deluxe Reading. 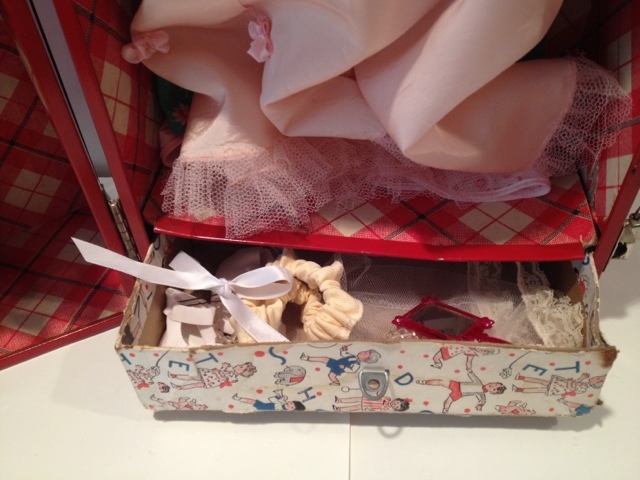 Then, some of the clothing in the box seem to be Sears Happi Time clothing for their ballerina trunk set, but the size is wrong. I decided to clean the ballerina up as best I could and leave the identification to others. The flocked blue ballerina outfit in the box fits the 15 N Revlon doll, as well as Elise, and the Dollikin Squirt and Horsman Rini. These are really hard dolls to clothe, as I've mentioned before, so it's exciting to find clothing. I was thinking of keeping them in my stash for future dolls, but I decided to list them instead for people who own actual, not hypothetical dolls. 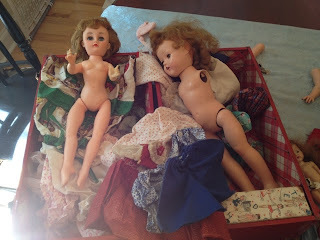 Besides the ballerinas and fashion doll clothes, the trunk has Cissy-sized clothes, Ginny sized clothes, and then a Ginny-type doll I have tentatively identified as Cosmopolitan Ginger. I haven't started in that doll yet, because the third doll in the box turned out to be much more interesting than any I've worked on for a while. At first, I thought I was working with a Roberta doll, perhaps Miss Roberta. The marks were wrong, though. A good deal of research finally provided me with a name: Barry Baby Girl doll by Universal company. You've probably never heard of her, because as it turns out, she is remarkably rare! An Internet and eBay search came up nearly empty. 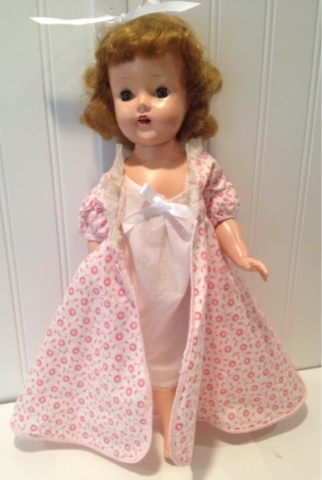 I am unable to say if her clothing is original, because I haven't been able to find a photo of the doll in her outfit. 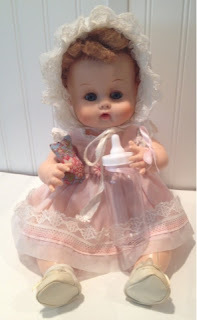 Even Doll Reference web site just shows a doll they say looks "similar" to Barry Baby! 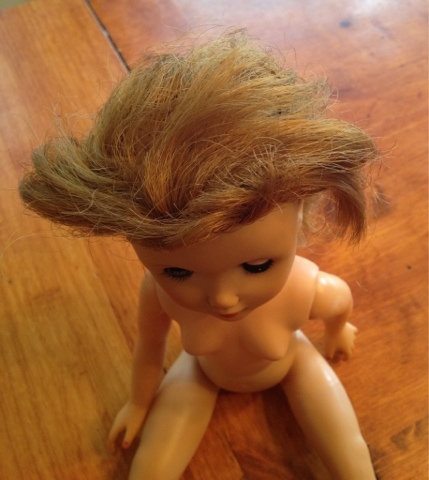 Once I'd re-attached Barry Baby's arms and styled her hair and cleaned her, I could see she is a high-quality doll. Her paint is lovely, with sweet blush on the hands and fingernails, knees, and cheeks. One hand has more pink on the fingernails than the other, but it doesn't look like there ever was much on the one hand. It's not scraped off or anything. So, I just left it because I think this is her original paint. I curled her Saran wig and arranged it to hide a thin spot. She looks a bit like Shirley Temple now! Besides this being a rare doll, she has amazingly unusual eyes. They are a clear, lovely golden hazel with touches of blue. 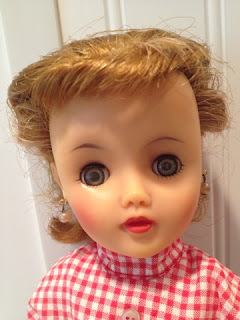 Most dolls of this era have blue eyes unless they are ethnic dolls. This doll is a head-turning walker, and her walker mechanism works perfectly. Her body is perfect, with no splits or cracks. All I had to do is clean her. 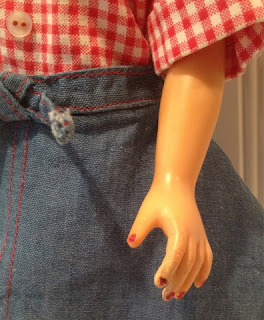 I found all the clothing that fits the doll and cleaned and repaired it as best I could. This doll is another one in a rare size; 15 inches but a child, not fashion, body with a thicker waist, so most 14 inch dolls clothes don't fit and neither do the 16 inch! There were plenty of clothes in the box that do fit, though, so I am assuming these were her original clothes. She has an ensemble for every occasion. I think the red taffeta plaid dress fits as though it was hers, except the back is rather tight. It fits her exactly. The green sundress/pinafore has some room, but this could mean there was originally another dress that went under it. 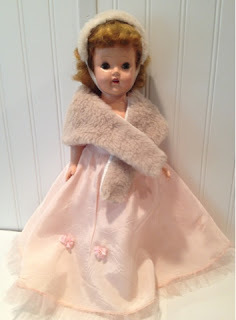 The pink silk-like dress fits well, as does the "fur" caplet and hat, so I guess this is another original outfit. There were several pairs of shoes in the trunk, but only the red Fairyland size 1 1/2 fit her well. The rayon socks don't exactly match, but this isn't really visible unless you look at them off the feet. I gave her a new-vintage pair of white shoes to go with her formal gown. I also gave her a vintage necklace and bracelet. She came with little hangers and a hand mirror. I covered some small holes in the dress with handmade flower decorations. 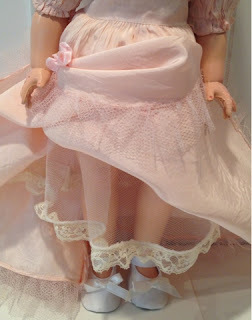 I made this crinoline for the doll. The metal trunk is in really good shape. I had to stabilize the cardboard drawer with clear tape, but it functions. I cleaned the trunk and decorated it with vintage-look travel stickers. I just think this is a wonderful set! My daughter couldn't believe how good the doll and her clothes and trunk looked when she got home from school! All these are available in my store, so make sure to check: http://stores.ebay.com/atelier-mandaline. Several months ago, like back in February or March I think, I purchased a big lot of dolls and clothes and other stuff. 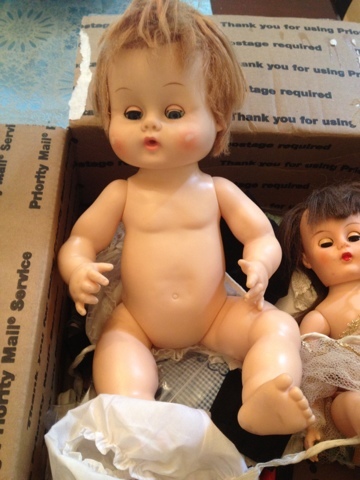 It was your typical estate doll lot: a big jumble of toys and other random household stuff. 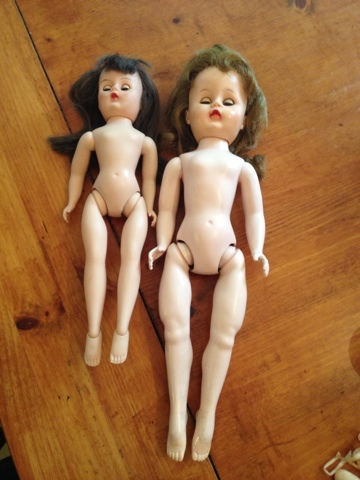 I purchased the lot because the listing mentioned an "Ideal doll" was in the lot and it looked like it could be a Revlon doll. I was thrilled to discover when the box arrived that the doll was not only a Revlon doll, but a rare 15 inch sized doll with the hard to find green eyes! I was less than thrilled to see the condition of the doll. 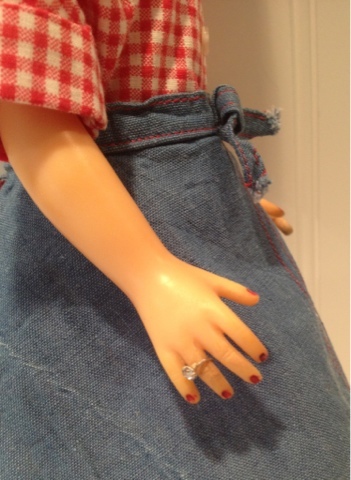 Two of her fingers had been chewed off. Someone had cut her hair into a horrible mullet (although she would have been quite fashionable in 1985 or so!). Her body had a variety of stains. She had clearly worn a dark outfit with black stockings for many years; I could see the exact place the sleeves and stockings ended because the dye had transferred. She also had various crayon and marker stains. One of her eyes was stuck open. Miss Revlon also was missing all her clothes except for a decrepit coat dress clearly not manufactured by Ideal. When you get one of these rare sized dolls, like the 15N Revlon or the Dollikin Squirt, one of the first things you notice is, hard as it is to find the doll, finding clothes to fit her is even more difficult! 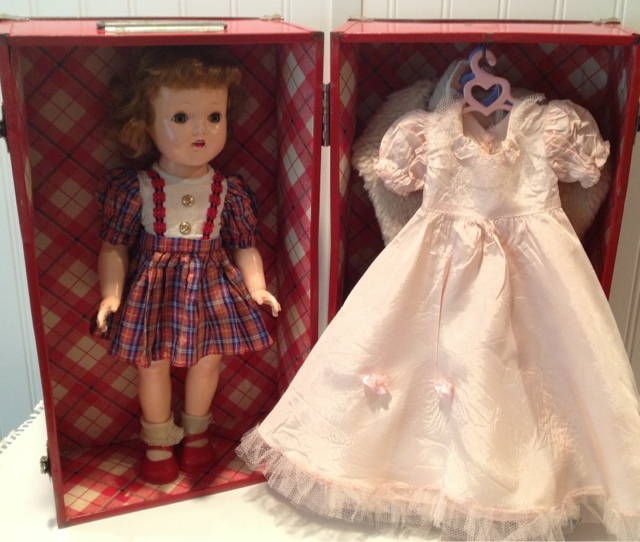 I'd hoped the clothes in the same box would fit the doll, but of course they didn't! So, it was clear I'd have to work on an outfit for her as well. 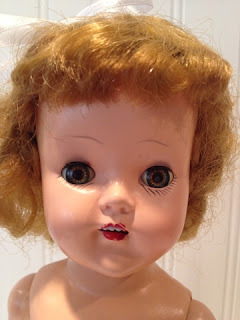 I started the restoration with a thorough cleaning and application of acne cream to the doll's stains. While the cream did its work, I tackled the missing fingers. I sculpted new fingers from hard plastic epoxy and painted them with oil paint. 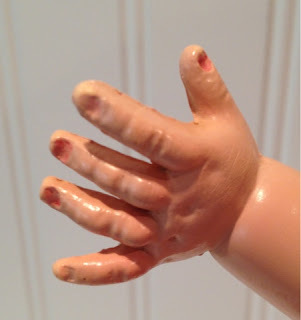 I sculpted new fingers and treated the doll's stains. After the fingers were addressed I went to work on the hair. Although the hair is still cut, I rooted in human hair in a good match to blend in the cut hair. Now, with a new set and style, you can't really see the cut hair at all. This Revlon does have unique highlights, since human hair has highlights the original Saran hair does not, and I think they look beautiful. 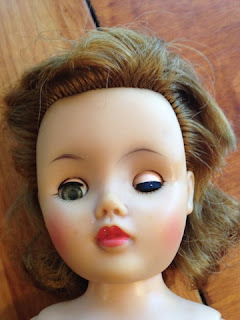 I gave the doll a partial re-root with human hair and fixed her eye. I thought of replacing the doll's eyes, but I didn't want to lose the unusual green color, and it's hard to find the correct size eyes since this doll is rare. I cleaned the doll's eyes and oiled them and now they are both functioning. The one eye does want to stick, though, and you have to give her a little thump sometimes when you pick her up or put her down, to shake the eye into working. When I looked through my doll clothes I found a Vogue dress originally for the 1964 Miss Ginny doll. I've had for a long time because it didn't fit anyone else and I've never come across a Miss Ginny. I tried it on the child-size 14-16 inch dolls, like Polly Pigtails or My Friend Mandy, but it was too tight in the waist for them. It's a perfect fit for the 15N Revlon. I was lucky enough to win a lot of 15 inch shoes. Most were singles, but there are a few pairs in the lot. I had some vintage doll earrings in my office, so I replaced the metal posts with 14K gold-plated posts that won't cause green ear. Then I made some stockings and an adjustable "diamond" ring for the doll. Then, when I was all done with the outfit, I ordered a new lot of dolls and clothes and...found a whole wardrobe to fit this doll! I'm working on cleaning and repairing these right now and I will be listing them separately in my store: http://stores.ebay.com/atelier-mandaline. It's hard tell the repaired fingers from the original ones! I made this ring. I really feel like this doll displays as a nearly new doll now. You don't see any of the repairs unless you look specifically for them. 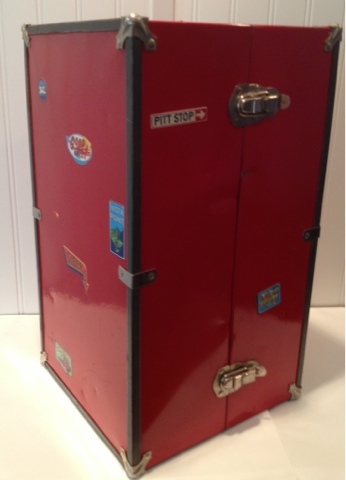 It's nice to have her in my case, as well, since my Cissette trunk set sold and I have bids on my Tonner Betsy McCall. I'm both happy and sad to say I can't keep dolls in my store at all right now! I think it's a good sign for the economy, since vintage dolls aren't exactly a necessity in life. They do bring us such good memories, though, so maybe they are more needful than we suppose. 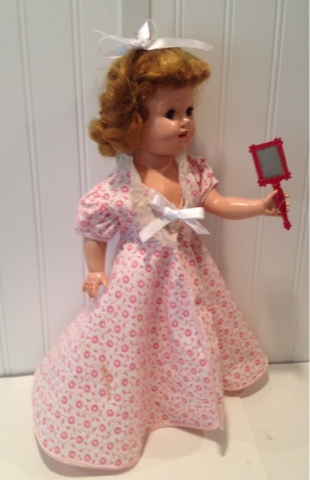 My Polly Pigtails' purchaser wrote to me to tell me she bought the doll as a reminder of her mother, named Polly. 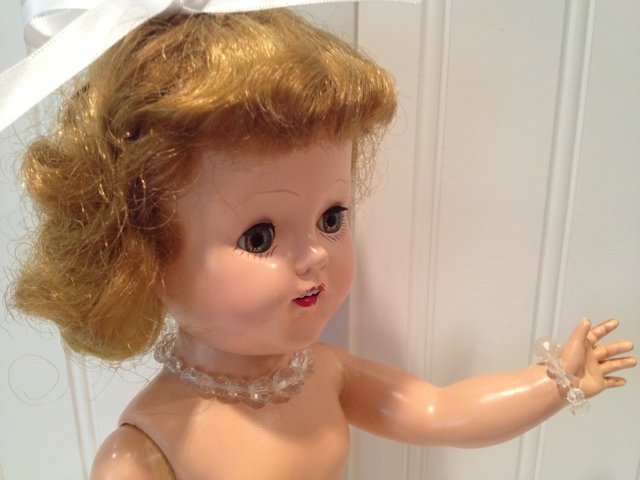 I love to hear all the stories behind why someone buys one of my dolls. So often it was their beloved toy, or their daughter's or their mother's, and when they see it again they are able to relive those days as a child or young mother. I totally get it! I gave her lingerie, shoes, and earrings with gold posts. I'm glad I have a new set of projects to work on, because it's almost time for the kids to head back to school. 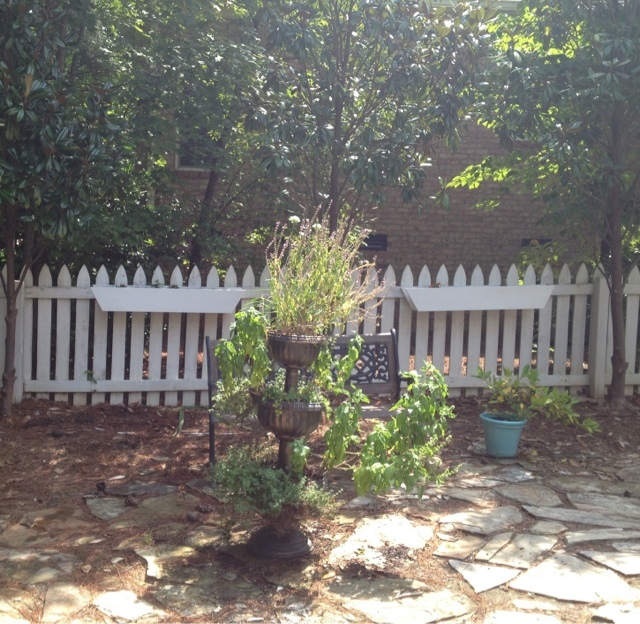 We had back to back open houses yesterday. This year my baby, who says, "I'm NOT a baby, Mom. I'm a big boy! ", will start private preschool three days a week with speech two days, so he'll be gone every day. The last times the baby started school we always had the next baby on the way and were doing adoption paperwork and everything. This is my first time sending one off with no prospect of another and I'm not doing too well. I've been weepy all week. I had to eat a whole tin of trout last night! Nothing assuages grief like salted fish! This Vogue dress is a perfect fit. I have a new niece or nephew on the way, but my sister lives too far away to see them very often. I used to watch her children several times a week, so I'm sad to be missing out on this new one too. I'm just trying to tell myself this will give me so much more time for myself. I'll be able to focus so much more on my store and maybe actually make a profit. I might even do well enough to have to file taxes! Jerry says, "You aren't going to bump me into another tax bracket, are you?" Maybe I will! At the very least, I'll be able to swim laps by myself for a month or so without having to worry about someone drowning, and I can sew myself some new clothes, and maybe go shopping alone. I'm sure if I focus on the positive it will all work out. Now the doll displays as nearly new! One big box of dolls I've been working on. The past week or so has been devoted mostly to shopping in order to replenish my store stock. My Polly Pigtails doll sold and traveled to her new home in California, leaving my cabinet almost bare and my store too! I was down to just four vintage dolls. I certainly don't mind shopping! It's a lot of fun. Now that the purchasing is mostly over, however, I've had to get down to work so I could start listing! I started with a large box lot of dolls, clothes, and various odds and ends. I found a Ginny Baby, I think from around 1968, in the box, as well as an earlier 1950s ballerina, probably by Valentine Doll Co. Most of the stuff in the box was 1940s or 50s, so I could be mistaken about Ginny Baby's age; she might be older than I realize. The vintage Ginny Baby after restoration. The Ginny Baby had her original outfit in very good shape, but she herself had been played nearly to death. Her hair had become matted and woolly. I thought at first it had been cut, but after I washed it and combed it out I realized it was just all squashed to her head and had a bit of breakage. Ginny had lost most of her eyelashes as well, and had various rubs and scrapes to her body. Over the weekend I set her hair in Shirley Temple ringlets, replaced her eyelashes with long blond ones (a better match), and refreshed her cheek paint. She turned out very cute and is ready for lots more play. 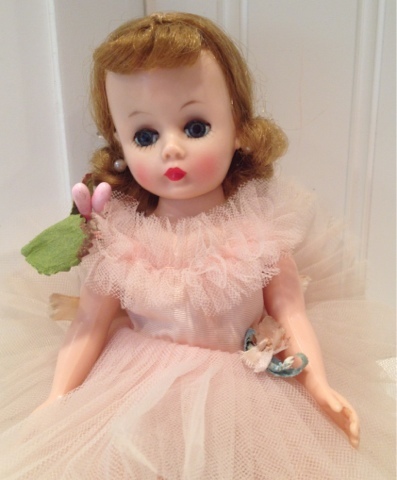 I had a large Valentine Ballerina doll from a different box lot purchased a few months ago. She was mostly just dirty. Someone had applied lipstick to her lips back in the 1950s, so that had to be scrubbed off. When I cleaned the lipstick away I could see why it had been applied; her lip paint was rubbed off. She also had the dreaded sticky vinyl face and darkening of the vinyl. The larger ballerina after restoration. I gave her a good cleaning, set her hair, refreshed her lip paint, and treated her face. This is an easy fix; just apply a thin coating of baby powder to the vinyl and gently rub it in. Then wipe away any excess with a tissue. The vinyl will lose its sticky texture and will also lighten some. The vinyl ballet shoes the doll wore were also sticky so I treated them as well. I was low on the vintage-style flowers I use to embellish doll costumes and hair, as well as some other supplies, so Jerry suffered through the clearance aisles at Michael's on our way home from a party on the other side of the lake. I found just what I needed, however, and have already put them to good use! The Valentine ballerinas have thinner hair on the back of their heads. 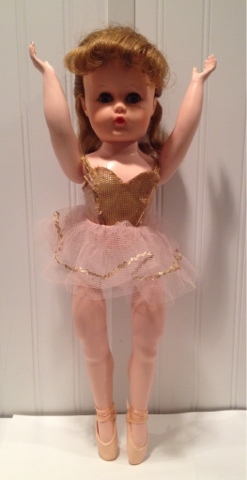 Today I finished the smaller ballerina doll, also probably by Valentine, from the Ginny Baby box lot. Her hair looks to have been cut, but it's really hard to tell. 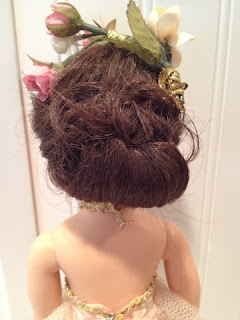 Many of the dolls from this period had their hair cut into style, so if the hair was to be styled in an updo the company would just cut away any excess. Sometimes only the necessary parts are rooted, leaving a great bald spot if you take the hair out of its original style! You can see both dolls have the short layer of hair in the center back of their heads. Upswept hair helps hide the thin spots. The small one's hair is definitely thinner, though, so it was probably helped along. I cleaned this doll and styled her hair in an updo to hide her thin spots in back. Her original dress needed some repair, and she had lost her shoes. I tried on various shoes from my stash of doll clothing and found she can wear a pair of ice skates I've had forever. These have never fit any other doll I've tried them on, so I decided it was Fate: she was meant to be an ice skater! 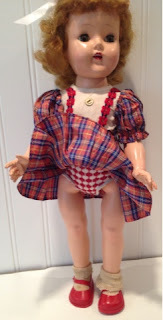 This doll has the jointed ankles like Madame Alexander's Elise or the Dollikin dolls and so she can wear either heels or flats, ballet slippers or ice skates. I transformed this doll to an ice skater! Looking around in my office I discovered a Tonner Tiny Betsy doll I'd forgotten about. Of course, she's a ballerina too! She was perfect except that the original owner had replaced her hair ornaments with ribbon from a different outfit. I made her new hair ornaments to match her ballet costume and she's good as new! I have one more ballerina in the works, a Cissette pink ballerina. This Cissette has just stunning high-color paint and a lovely, new-looking wig. She had lost her clothing when I got her and had a crotch split that needed repair. 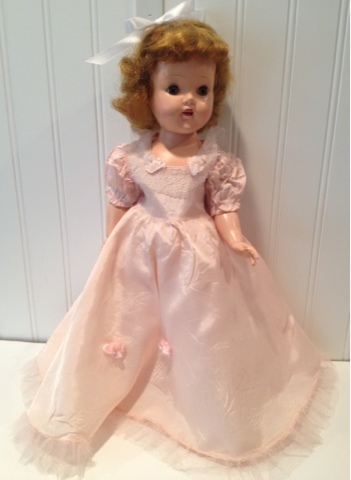 I got her all repaired and found a Madame Alexander ballet dress for her and now she's just waiting on shoes and a crown of flowers to be listed. 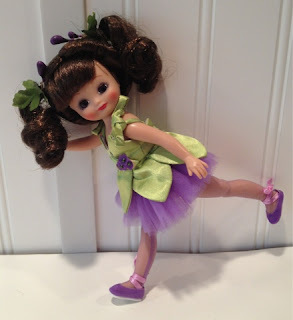 This Cissette ballerina doll is nearly finished. I have gotten sick, over the past few rainy months, of waiting for paint to dry, so I ordered some heat-set oil paints and a heat gun to dry them. This is the best invention ever, in my opinion! The paint stays wet until you cure it with the heat gun, and then it dries immediately. The Cissette had been sticky for a week with paint that wasn't drying on her epoxy repairs, so I dried it with the heat gun in minutes! 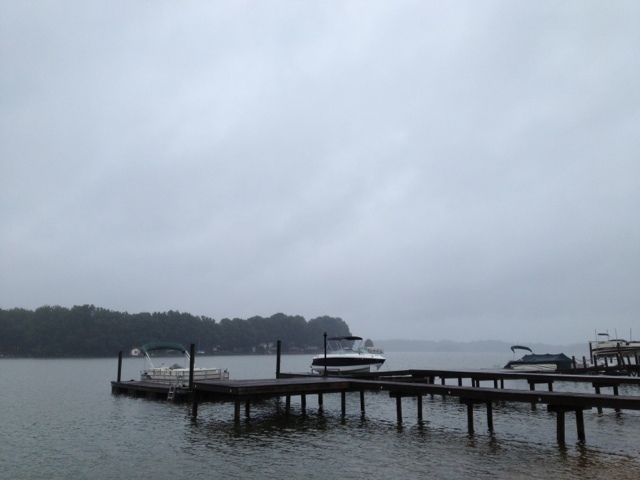 Another rain-washed day on the lake. Besides all the doll repair, I have been working in the garden. 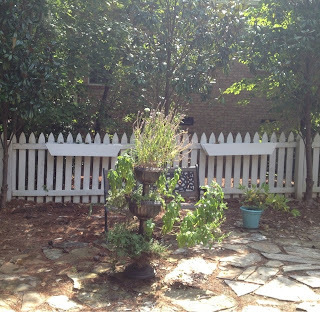 This week we decided to tie up all the plants, because they keep getting knocked over in storms. I read that if you use old nylon stockings tied to metal you can actually increase your yields. This is because static electricity created by the nylon and the metal transfers to the plants and gives them extra "shock therapy" to help them grow. So I went to Walmart and found a bunch of discounted pairs of knee highs for 33 cents a pair. We cut them up and used them as ties. We will see if there's any great jump in our yields. I will keep you posted on that! Nylon ties attached to metal are supposed to increase yields. 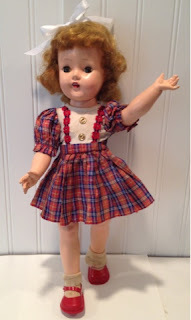 I've been listing the dolls as I finish them, and I have more to list, as well as Betsy McCall and Ginny clothes to fit the small 8 inch dolls, so please keep checking my store: http://stores.ebay.com/atelier-mandaline. Well, once again I haven't done any doll work for a couple weeks. It took a solid week to slog through listing all the kids' outgrown clothing. I didn't get to do my back to school listings for the past two years because of all our moving. The clothes have been in storage, and if you've raised three children you can imagine, I'm sure, how much clothing that accumulates over two years of growth! I just hate listing clothing. For one thing, the boxes were all dusty, so I've been sick for about two weeks now. I am so allergic to dust it's almost off the charts when they test me. Much more reaction and I'd have to live in a bubble! Then, you have to iron everything so it looks nice, and photograph any flaws, and repair any dropped hems or missing buttons and all that stuff. I'm glad to report I'm nearly finished. I know I still have some shorts and hoodies around here somewhere, but I can't find them just now, and I'm so tired I almost don't want to! You might remember we were working on our bedroom a few months back, and I was lamenting the nasty old mustard yellow shag carpet in there. Not only was it ugly to begin with, but it had gotten so dirty there was a gray band around the edges of the walls! Not a good environment for me! Finally, finally, we were able to buy some laminate for that room, and this weekend my parents came so my dad could help install it. I could hardly be in the room during the pulling of the carpet and floor installation, so this won't be a tutorial. Just moving the drawers and furniture kicked up enough dust that I was in awful shape, and the sawdust and everything almost sent me over the edge. I'm surprised I didn't OD on allergy medicine over the weekend! My observation, from a safe distance, is that installing flooring requires a lot of cussing. I shudder to think of the language our teen picked up this week! Naturally, our flooring arrived the same week my sister is moving to a new house. Her house needs a ton of work because it was a short sale the previous owners had been renovating when they ran out of money partway through. They had asked my dad to help with that, so my parents came in and the men all worked like dogs to get the floor put in over the course of two days. They started late Friday evening and finished Saturday night. 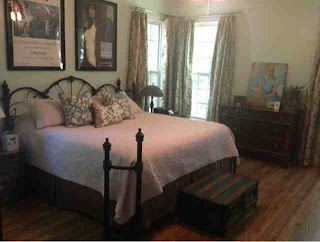 The color of the floor is Driftwood Oak. The room looks wonderful, though! 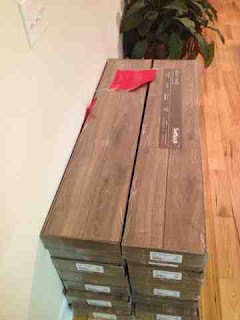 We chose allen + roth laminate in "handscraped driftwood oak". I like it because the rest of the house has very light finishes, like maple flooring and ivory walls, so this goes well. I like the look of dark wood, but it wouldn't look right in here, and this driftwood finish sort of looks both dark and light at the same time. It has a lot of gray and blue tones as well, and that matches my linens. The distressed look coordinates well with all our old furniture in there, too. The funny thing was, my dad, not a fan of the weathered look, kept asking if we weren't supposed to polish it! We haven't ever had enough money to buy a whole bedroom set, and I don't much like the matchy-matchy look of those anyway, so we accumulated our furniture over time. We have no less than three antique trunks people have given us over the years. We use them as nightstands and at the foot of the bed, and the old wood on those looks quite similar to the floor. I still want to find a chair or chaise and a little end table and lamp for the corner of the bedroom, where I might be able to relax and read a book by myself. I do love our children, but a little "alone" time would not be unwelcome! 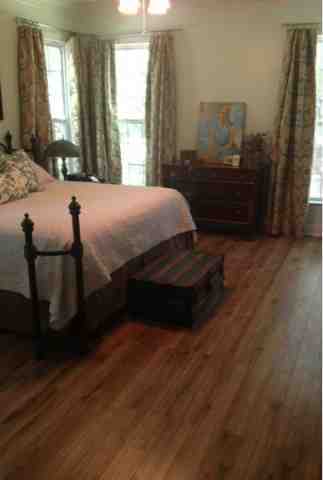 I think the floor looks great with our antique furniture and linens. Now that the bedroom is mostly done and the kids' clothes are mostly listed I can get back to my dolls. My Cissy trunk set sold the first week, so I am working on another one. I have several Cissettes in the works too. I got a Dollikin this weekend I planned to dress and sell. She just needed a cleaning and some stringing, it looked like, and I have her original outfit in my "stash". Unfortunately, something happened in transit and her knee joint froze up while she was shipping. The seller packed her well, so I guess it was just one of those things, but now I have to try to figure that out before I can sell her. It's too bad, because my store is low on vintage dolls again, so I hoped that one would be a quick fix and sale doll, but it was not to be! The garden has suffered recently, from the storms we've been having. On Saturday a storm blew up out of nowhere and knocked over my herb tower and all my potted plants, as well as my tomatoes, so everything had to be propped up and re-potted. We do finally have some eggplant ripening, and some cucumbers, and even our peppers have overcome the cold, wet summer. The peppers were marked Giant Marconi when I bought them. I specifically look for those, because I planted them a few years ago and we got such a yield we ate them two or three times a week all summer and froze enough for two more years! They are a green, banana-shaped pepper, and they are enormous. Each pepper is five or six inches long at least! I was elated to see them here, and bought six plants. Four survived the rain and started to produce, but...these are NOT Giant Marconi! I'm not sure what they are. The peppers they produce are very nice, medium-sized, and heavy for their size, sweet bell peppers. 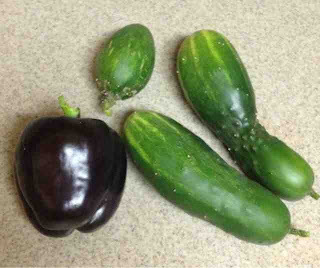 The peppers are dark purple, though, almost black, when they ripen. I made Philly Cheesesteak chicken sandwiches in the slow cooker on Friday while we worked on the floor and used the peppers. They were very good in that recipe. Like red cabbage, the purple peppers turn green when you cook them. That is a great recipe, and you can find it in my Pinterest recipes board. Tonight I'm making Pinterest slow-cooker Honey Sesame Chicken. That's another recipe on my Pinterest board. I make it as shown, except I add pineapple and some kind of frozen Asian stir fry vegetable mix so it's a one-dish meal, and I increase the sesame seeds and use sesame oil. I serve it over rice. I got a great tip from Pinterest recently. My sister shared this one with me. When you have a dirty microwave, you can fill a bowl with white vinegar and heat it for about 1 minute in the microwave. Then just wipe off any crud with a dry paper towel. Let me tell you, this works! Someone blew up taco filling all over the microwave this weekend ( I have a cover, but will anyone else use it? NO...) and with everything going on I didn't tackle the mess until today. It worked like a charm! There were a lot of little bits of dried beef that fell down off the walls of the oven and I just vacuumed them up with my dust buster. I use the dust buster to clean crumbs out of our convection oven too. Everything else in the microwave just wiped away! I nuked the vinegar for about 45 seconds. I don't know which doll I'm going to tackle next. Besides the Cissy and Cissettes, I have a Ginny baby and a bunch of Ginny clothes to list. Keep watching my store for those and for my children's clothing: http://stores.ebay.com/atelier-mandaline.